Check out the awesome package I got from Chewy.com! It even has my name written on it in sparkles! It is four cans of Nature’s Variety Pride by Instinct! I got two different flavors, Sherlock’s Salmon Recipe and Champ’s Chicken Recipe. They want to know what I think of these, especially because I am a very picky eater! Well, look who is here… a non picky eater! She will have to be locked up in another room so I can do my taste test in peace. Boodie is allowed to stay because she is polite and won’t try to steal the food while I am testing it out. So far, I like the salmon better than the chicken. All the Pride flavors are grain and gluten free. My human thought they were a little heavy on the veggies, since kitties are obligate carnivores and should eat primarily meat, but she cares even more about whether I will actually eat something. You know what? I really like the salmon! Boodie is getting bored watching me eat it. 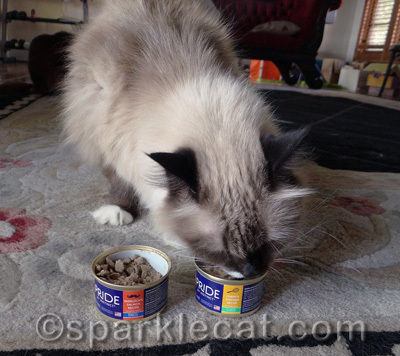 The chicken flavor is all right, but Sherlock’s Salmon Recipe gets my paw of approval for sure! I am not too happy that my human took this photo while I still had food on my nose. Can you see how much more of the salmon I ate than the chicken? 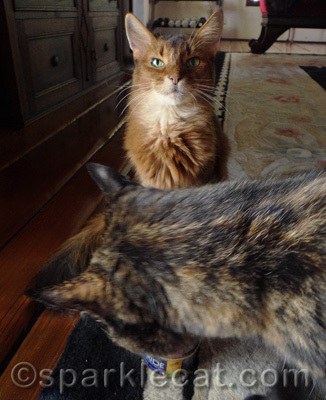 Don’t worry — Boodie finally got to have some… and she preferred the chicken! 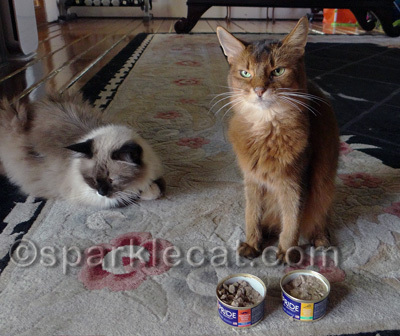 Later on, Binga got the other can of chicken for dinner, which she inhaled. 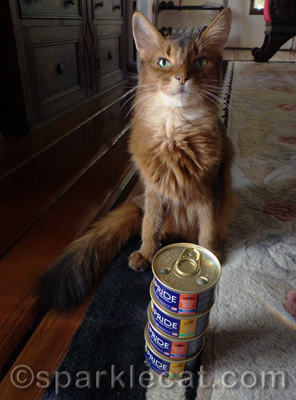 My human saved the other can of salmon for my breakfast the next day! 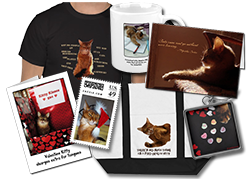 Glad you liked at least one of the tasteÂ´s , Sparkle ! 😆 So Mum waited til me doggie furend Sadie Mae bizited n she got sum guud food…. 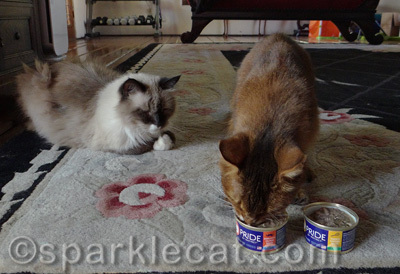 We are glad ya all liked the foods, but we think that having yer name all big like that on the package is PAWSOME! This looks yummy! And it is so good there is something you like to eat. We picky eaters need variety. We wonder if you would perhaps join Sampo in his salmon song ? He sits on the kitchen table and calls and calls for the fridge door to open, so that the salmon will leap out onto his plate. It is most noisy! Ooh, those look pretty darned tasty, Sparkle! Thanks for the helpful review! I can’t believe Boodie waited like that! That sure was polite. Does it have a lot of gravy? My Grace only does gravy these days. I’ll have to add that to my list of stuff to try. Problem will be finding it by the can, not the case. It’s good to know it’s grain free. Is it soy free? Is the chicken flavor fish free? Does it come in pate? I know, I ask a lot of questions. I know this drill! Now your human will buy a case of the salmon and you won’t look at it again. Right? That’s what I do! We can’t believe that your mom feeds you canned food on the rug. That’s brave of her! It’s hard to find a canned food that doesn’t have a lot of odd things added in. The head peep is starting to look at options for Ashton’s upcoming d-i-e-t, and it’s dismaying. We think that these flavors got several paws up for more! Mum says I am a picky eater too. I say I am discerning. Eric used to inhale everything in sight too. Some of the food I get has peas, carrots or pasta in it. Peas and carrots are bad enough, but whats with the pasta? I always leave that on the side of the dish. I won’t call me a picky eater, I just know what I like. I will NOT eat anything but Fancy Feast Fish and Shrimp and my crunchies. I don’t even like treats….Does that make me weird? Thanks for the review!!! 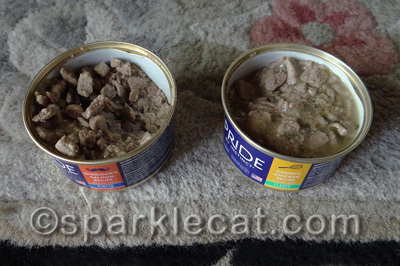 The Farm cats really liked these foods too. We’re glad you liked the food Sparkle, we did too! Poor Binga though! 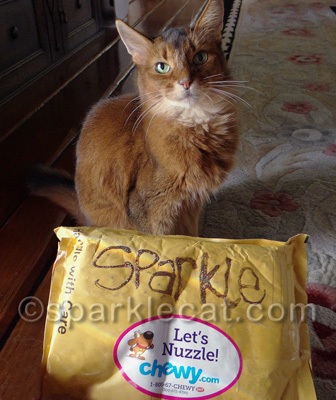 Nothing like a good flavored yummy showing up at your door Sparkle! I have one picky eater too. Both of those do look pretty tasty. Sparkle you always look good. Sounds like the taste test was a SUCCESS! Yoo-hoo! YOO-HOO!!! Sparkle you look beautiful even with food on your nose….I would have preferred the salmon myself – and for it to be smushed up with a bit of water because I don’t eat chunky stuff BUT salmon gets a paws up ’round here too. 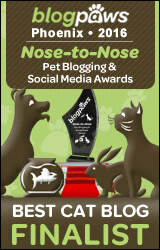 I think it was lovely that between Binga and Boodie the rest of it was “approved” of……well done! Thanks for the great review pals. I think I’d like the Salmon better too. Lately I’ve had a real taste for that. We love the PACKAGE it all came in!!! Wow..now that’s cool. You just KNOW what’s inside has to be good. I know I say this A LOT but…..LOL Binga!!!!! I’m glad Boodie is so polite and liked the chicken. SHERLOCK SALMON…WHAT A CREATIVE AND APPEALING NAME….MAKES YOU WANT TO INVESTIGATE IT. 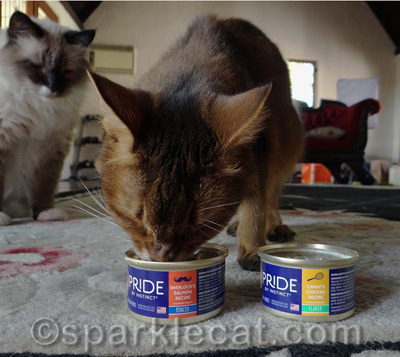 We taste-tested the Pride by Instinct too…and loved them. So much that the mom ordered more for us! Boodie is so polite! So happy you enjoyed the food.. Lucy is going to be testing some out too! I wish we had that over here. We suspect senior Aunty Peanut (A life time sick-o-matic) might cope very well with it. We’re glad you found something you like! Binga is such a photo & food hog!!! She could learn from Boodie! I too am a very picky eater, Sparkle. And I think that Genji is even worse than Binga in terms of “food-bombing”! Glad you liked at least one of those. Oh Miss Boodie. That Ham should take some lessons from you.